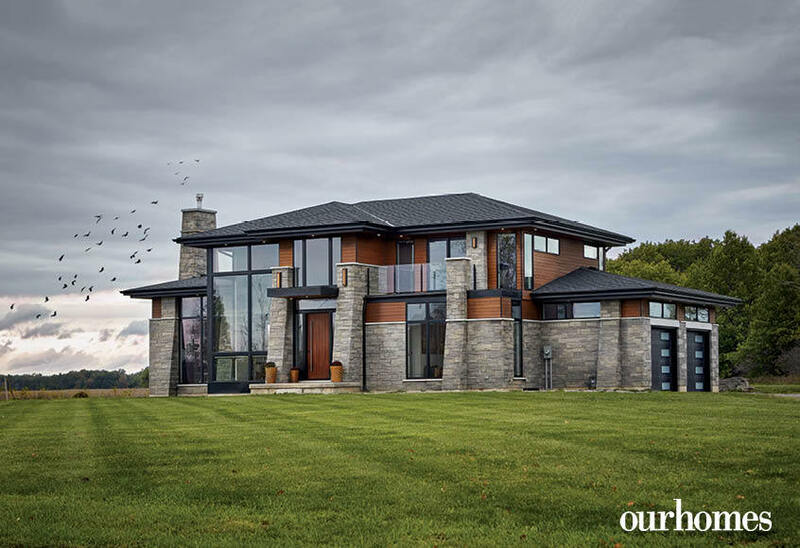 A modern masterpiece showcases a builder's versatility in the Niagara Region. 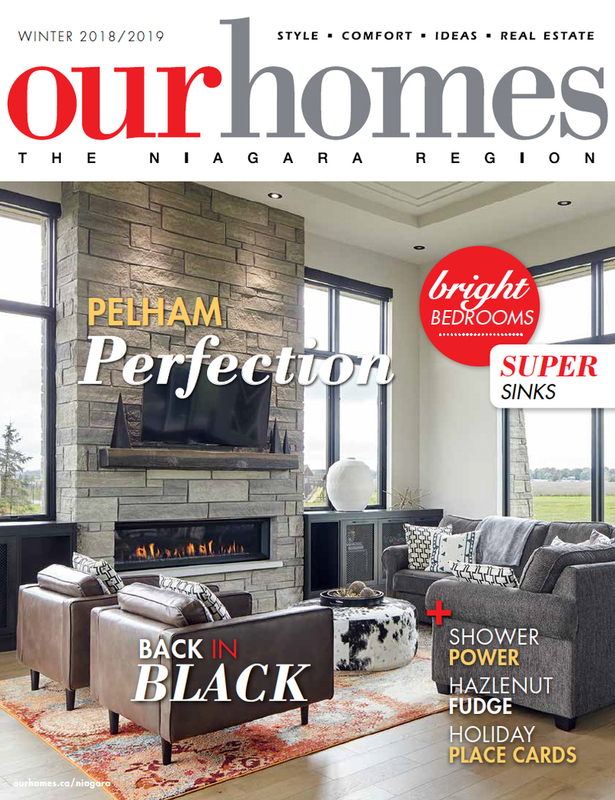 A version of this article originally appeared in the Winter 2018/2019 issue of OUR HOMES The Niagara Region, p.24. Find local businesses in our Niagara directory. 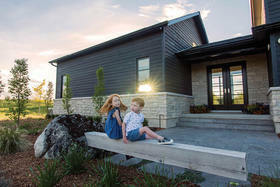 For years, Darren Hendriks, vice-president of custom homebuilder Homes by Hendriks Inc., lived in a 950 sq. ft., 1960s bungalow in Fonthill. It was fine as a starter home when he and his wife Amy married. But it was nothing like the stunning and spacious abodes Darren was building for others who tapped his family’s business to make their dream homes a reality. 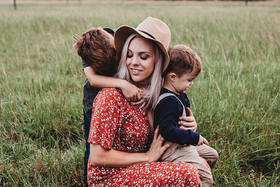 In late 2017, Hhe and Amy and their two children, Alana, 2, and Kane, 1, stepped into a new 2,600 sq. ft., ultra-modern two-storey overlooking the Welland River in Fenwick. 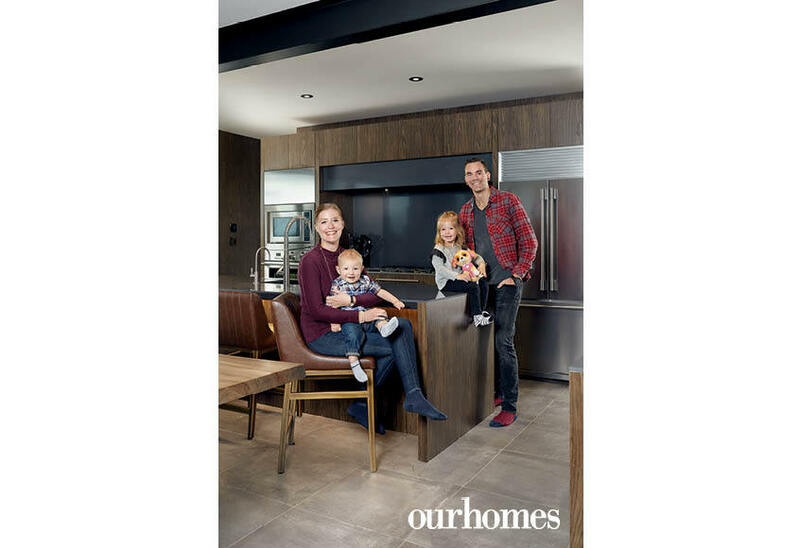 “When we designed the home, I was obviously very excited to build it,” says Darren, the third generation to helm Homes by Hendriks, which is known for building and renovating more traditional houses. The couple found two acres on Fenwick’s southernmost periphery. It was more land than they had initially been considering, but the location was ideal so they bought it. All that space changed their vision for a home. Their swath was wide, enabling architectural designer Santy Yeh of Designs by Santy to stretch the home’s footprint in proportion to the property. 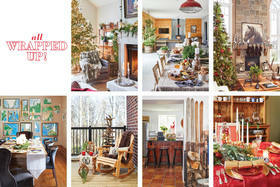 Rooms were positioned to take advantage of the views – river to the front, woodlot to the back. 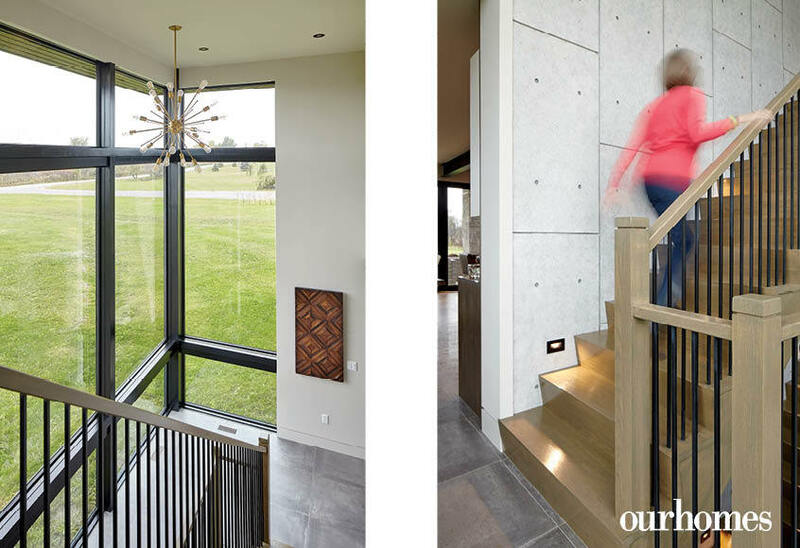 Glass gets top billing throughout much of the home, including as a feature wall in the living room, and stretching two storeys high in the foyer to showcase hockey-stick stairs by Amber Stairs & Railings Inc. inside, and big, country sky outside. Hunter Douglas shades installed by Dell Smart Home Solutions are set to a timer and controlled by smart phone. The couple are big on entertaining at home so an open floor plan on the ground level was a must, along with an easy connection between the kitchen and back patio. The galley kitchen is equipped with Fisher and Paykel and Frigidaire stainless steel appliances from Nickerson Home Appliances. 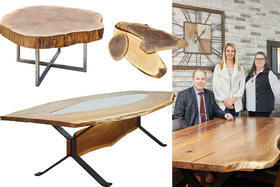 A custom live-edge dining table made by Wade Daboll of W.L. Daboll Construction seats 10 and extends the eating and gathering space. The dining area merges into a comfortable family room decked out in wide-plank hardwood from Aristocrat Floors of the World in a mid-tone finish. Aristocrat’s Rhoda Cipparone advised on flooring, paint colour and furniture to keep the interior as eye-catching as the exterior. She collaborated with Eileen Santoro of Design Concepts by Window Decor on ideas for artwork and lighting wired by Verhoef Electric Inc. In the kithen, dark brown and white kitchen cabinets by Cromade Cabinetry stretch around the corner from the main kitchen area into a nook that provides extra storage and a functional coffee station. 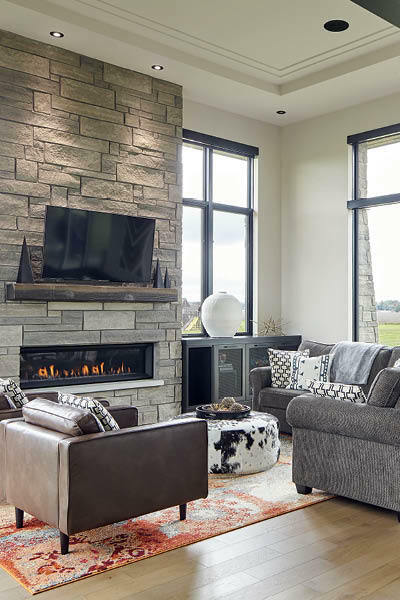 In the living room, the windows look as though they were built around the chimney, which is done in steel grey Arriscraft shadow stone in from Burnstein Brick. The chimney is the backdrop to a gas fireplace from Stamford Fireplaces and matches the angled columns that run the perimeter of the home outside. 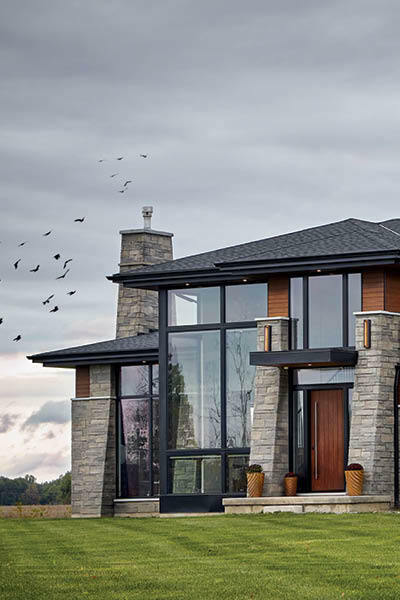 Glass, stone and straight lines dominate the ultra-modern facade of this home. Siding appears as though it extends continuously around the soffits and into the walls. An oversize, textured fibreglass door greets visitors. 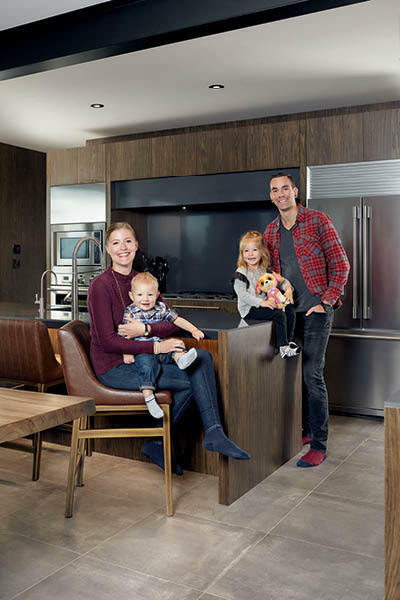 Builder and homeowner Darren Hendriks of Homes by Hendriks Inc. and his wife Amy with children Kane, 1 and Alana, 2. The living room offers a variety of views thanks to glass feature walls overlooking the Welland River on one side and a woodlot on the other. Windows look as though they were built around the chimney. 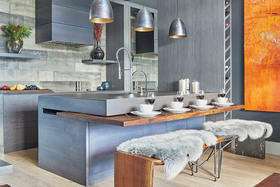 In the dining area, steel beams were left exposed and powder-coated in black to complement window frames and pot lights. White dining chairs contrast against the large live-edge table and grey tile floor. A pair of modern chandeliers add a geometric influence. 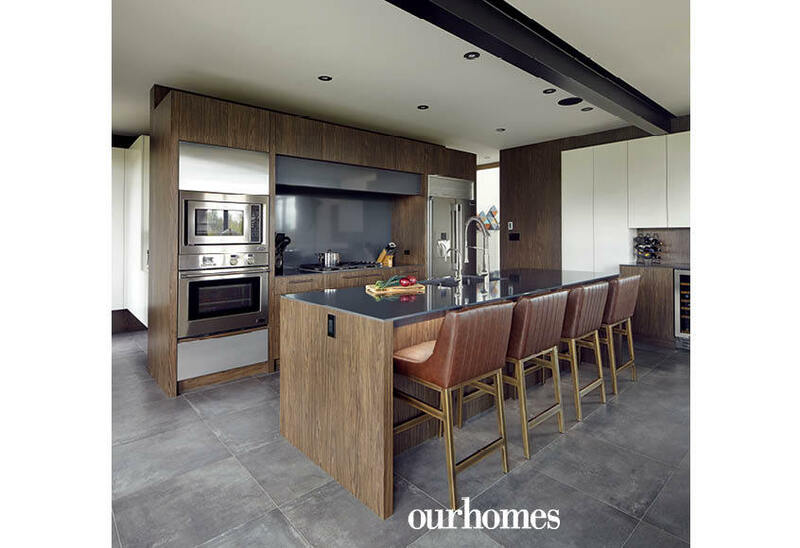 The rich brown kitchen offers plenty of seating for casual entertaining at the quartz island and lots of storage to keep staples hidden away. Cupboards in contrasting light and dark open with a gentle push rather than being pulled with handles. 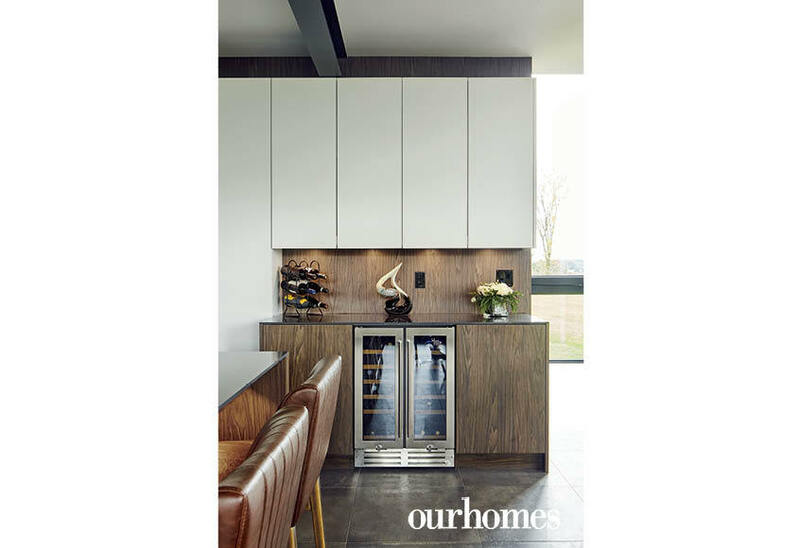 A wine fridge is easily accessible in the open-concepts kitchen-dining space. 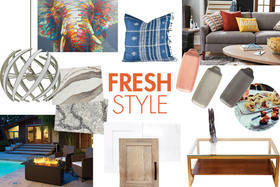 Thoughtful design touches are found throughout the home. Heating registers were cut from floor tile to blend seamlessly. 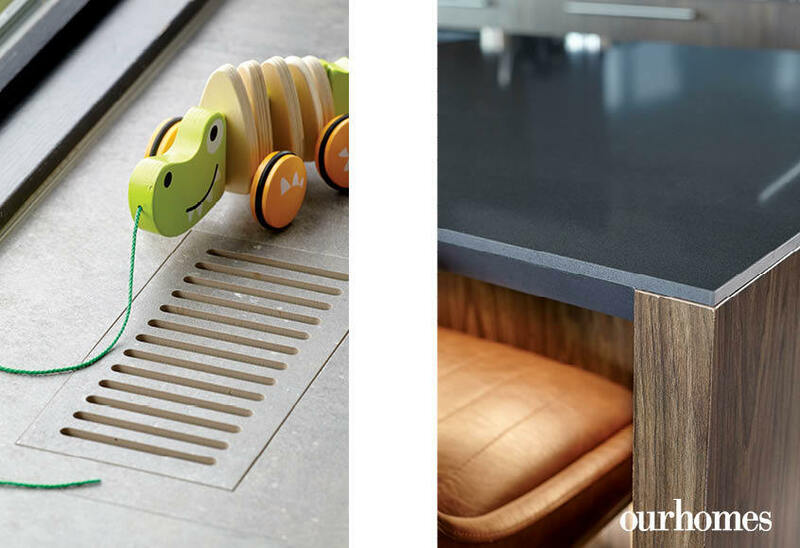 Quartz countertops are bevelled to look thin and sleek at first glance. 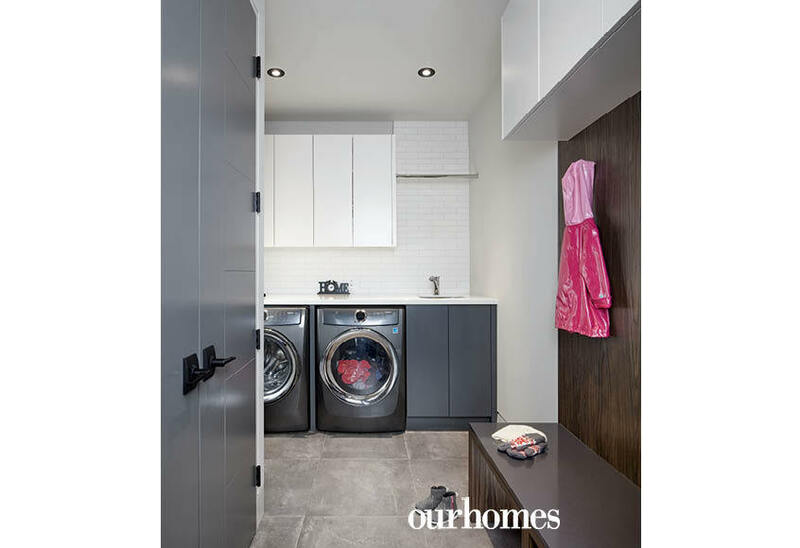 The mudroom and laundry room share a space off the garage. Subway tile in white keeps the room bright against darker cabinetry that coordinates with the rest of the home. Grey doors have a linear motif and black hardware. The home office doubles as a music room. 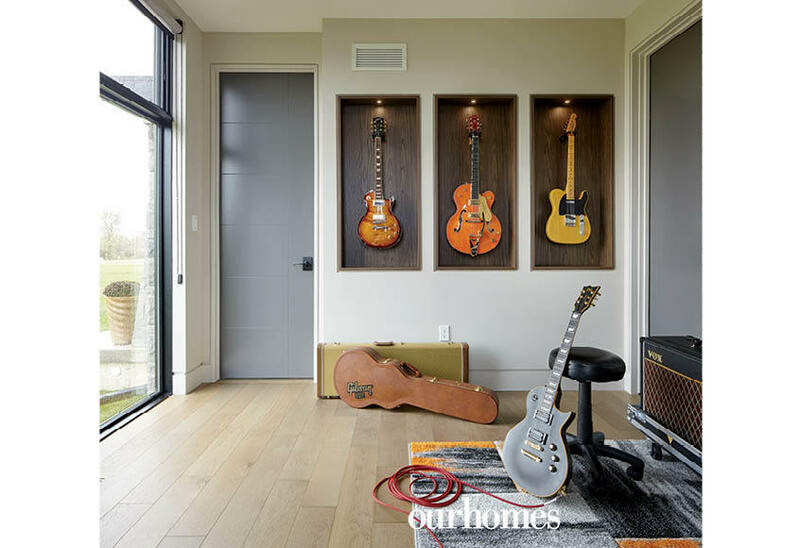 Three alcoves in contrasting dark maple are top lit to showcase a guitar collection. The foyer features floor-to-ceiling windows that provide a glimpse of a hockey-stick staircase inside. Foam panelling looks like concrete but adds warmth and helps with acoustics. The earth-toned master suite is situated with windows facing east. The homeowners are early risers and wanted to be able to take in the sunrise. The simple design incorporates a feature wall as a headboard design. The platform bed and floating side tables keep the look clean. The master en suite features all the conveniences and comforts, including a vessel tub. 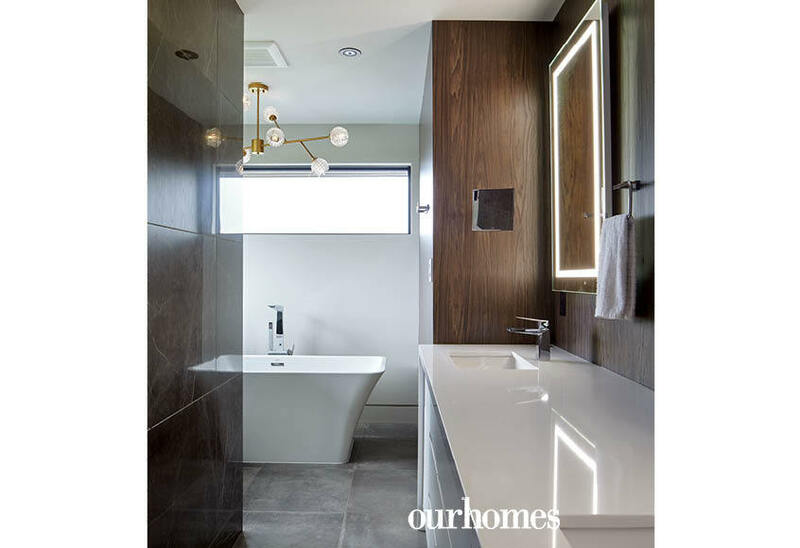 A gold-toned chandelier above the tub is horizontal in dimension, just like the window above and the room itself. 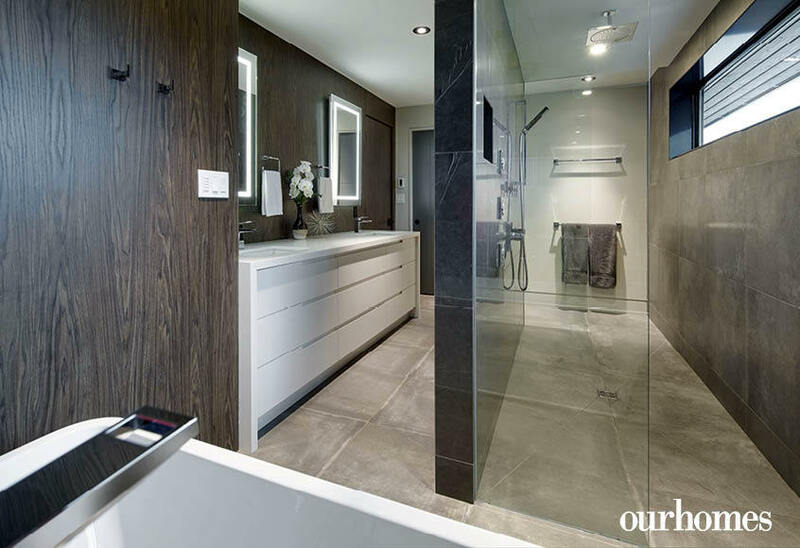 The master bedroom en suite features a walk-through shower, accessible from each end of the room. A white, double vanity stands brightly out against darker walls and tile.